Roderick Moody’s On Deck compilation series looks like it’s about to become BBE Music’s latest success story. The latest instalment in the series, BamaLoveSoul Presents On Deck 3 will be released on 23rd March 2015. That’s just over a year after the much lauded BamaLoveSoul Presents On Deck 2. After its success, it looked like the On Deck series compilation series was about to become a fixture of BBE Music’s release schedule. That proved to be the case. The story behind the On Deck series, began three years ago. For any aspiring entrepreneur, spotting a gap in a market can be a short cut to success. For Roderick Moody, that proved to be the case. He, like a lot of people he knew, liked their music soulful. However, local radio in Alabama was churning out a diet of mainstream R&B. There was no alternative. It was a case of Hobson’s choice. That’s until Roderick Moody decided to shake thing up. Roderick, whose better known as DJ Rahdu is known as a musical tastemaker. He’s a man with his finger on America’s musical pulse. Not only that, but Roderick is also the host of the Diamond Soul Xxxperience Show. Alabama was the next state to hear the Diamond Soul Xxxperience Show. Once a week, for two hours, citizens of Alabama could listen to the Diamond Soul Xxxperience Show. This meant all things soulful. It didn’t matter whether it was Caribbean, funk, hip hop, house or jazz as long as it was soulful DJ Rahdu would give it a spin. There was only one musical no-go area….R&B. DJ Rahdu figured that other stations were catering for the needs of fans of R&B. This has proved a successful formula. What started in a small way, is a worldwide phenomenon. Having established a reputation as a purveyor of all things soulful, DJ Rahdu decided to hot the streets. He began holding open mic events. Then in 2012, DJ Rahdu launched his BamaLoveSoul.com website. It’s been discovered by over one-million music fans worldwide. Then in 2012, DJ Rahdu released BamaLoveSoul Presents On Deck. Released to critical acclaim, the compilation proved a commercial success. So much so, that on two years later, BamaLoveSoul Presents On Deck 2 was released by BBE Music on 10th February 2014. BamaLoveSoul Presents On Deck 2 caught people’s attention. When compiling BamaLoveSoul Presents On Deck 2, DJ Rahdu asked artists to submit a new track. The response was overwhelming. So, he spent time working his way through this mountain of soulful music. Eventually, he managed to settle on a dozen “future soul classic for the new b-boy generation.” These tracks became BamaLoveSoul Presents On Deck 2, which showcased a new generation of artists whose raison d’être was creating soulful music. That’s the case with BamaLoveSoul Presents On Deck 3. For BamaLoveSoul Presents On Deck 3, DJ Rahdu has picked tracks from fifteen up-and-coming purveyors of soulful music. This includes contributions from Salah Ananse, Columbia Nights, Idesia, Renee Dion, Dos Angeles, Sean Haefeli, Doc Mastermind, Henry Wu and Saturn’s Children. They’re just some of the fifteen tracks that feature on BamaLoveSoul Presents On Deck 3, which I’ll pick the highlights of. Opening BamaLoveSoul Presents On Deck 3 is Alive, a track from Waju and Garimastah featuring Muc J. This is a collaboration between Southern Californian MC Waju and Moscow-based producer Garimastah. It featured on their Live and Direct E.P. It’s a mellow, understated slice of old school hip hop, with a dreamy, jazz-tinged sound. After sixteen years working as a producer and DJ in Alabama, Salah Ananse knows what makes a dance-floor tick. Salah also has an impressive C.V., including remixing tracks for India Arie and collaborating with Anthony David, DJ Kemit and Gaelle. All this helped Salah’s soulful music gradually find a wider audience. Hopefully, the inclusion of the uber soulful When I Call on BamaLoveSoul Presents On Deck 3, will see Salah Ananse’s music reach an even wider audience. Columbia Nights are based in Washington D.C. That’s where Hayling Price, John E Daise and Jason Edwards and combine the music of the past and present. Their influences include soul, fusion, hip hop and electronic music. These influences can be heard in Wait A While. It’s a slow, wistful and beautiful ballad with a needy, soulful vocal. It was on September 2014, that Idesia released Nu as a single on Bandcamp. It’s a track that at first glance, epitomises the Nu Soul sound. Listen closely, however, and sometimes, the drums have a hip hop sound. However, what makes the track are Idesia’s vocal and her lyrics. With the right record company behind her, the future could be bright for Idesia. Renee Dion is a stalwart of the music scene in Columbus, Ohio. She’s best known for her fusion of jazz, R&B, hip hop and soul. It’s a potent and heady brew. That’s apparent from the opening bars of Not Enough, which is slow, soulful and sultry. Describing Sean Haefeli isn’t easy. He’s a singer, songwriter and pianist. Sean is also versatile, and is just as comfortable crooning, playing jazz, singing soul or MC-ing. That’s apparent on Essential, where genres seamlessly melt into one. The result is a track with a jazz-tinged sound that’s Essential listening. Rob Milton must be unique. After all, no other songwriter can have written a song about love, computers and binary code? However, Rob did. Her is a collaboration between Rob Milton and MC Ill Camille. Together, they’re responsible for a captivating and soulful tale of applied mathematics and love. J. Mitchell Melodiousfly is another talented singer-songwriter. Her contribution is Holy Breath. It’s a tantalising taste of what the Los Angeles based rising star is capable of. Having taken Tinseltown by storm, playing at The Roxy, The Temple Bar and The Hollywood House of Blues, a great future is forecast for J. Mitchell Melodiousfly. She’s been inspired by everyone from John Coltrane and Miles Davis, through Ella Fitzgerald, and Nina Simone, to Jimi Hendrix, Shuggie Otis, Erykah Badu and J Dilla. They’ve inspired J. Mitchell Melodiousfly is able to produce music that’s beautiful, melodic and sensual. London based, Henry Wu, released his Negotiate E.P. on Ho Tep Records on 2nd March 2015. Without doubt, the highlight of the Negotiate E.P. is Joint Seventeen. Slow, mellow, laid-back and jazz-tinged, this is one of the highlights of BamaLoveSoul Presents On Deck 3. Closing BamaLoveSoul Presents On Deck 3 is Suede Jury featuring Chris Faust and Chris Turner. Suede Jury is a Brooklyn based producer, whose music ranges from hip hop and rap to experimental music. On Soul Child, Suede Jury joins forces with Chris Faust and Chris Turner to create a track that’s variously moody, melodic and soulful. It’s the perfect way to close the latest instalment in the On Deck series. Just like Bama LoveSoul Presents On Deck 2, Bama LoveSoul Presents On Deck 3 will allow a new generation of artists to have their music heard by a wider audience. Bama LoveSoul Presents On Deck 3 is, in effect, a showcase for their music. Hopefully, the release of Bama LoveSoul Presents On Deck 3, on BBE Music on 23rd March 2015, will give each of these artists the break they’re looking for. After all, none of the artists on Bama LoveSoul Presents On Deck 3 are lacking in talent. Far from it. They’re all talented artists. All they need is a breakthrough. Then, their music can be heard by a much wider audience. Whether it’s hip hop, fusion, jazz or Nu Soul, each of the artists have plenty to offer. That’s apparent throughout Bama LoveSoul Presents On Deck 3. Many of the artists on Bama LoveSoul Presents On Deck 3 are determined to innovate. That’s no bad thing. Nowadays, too much music that’s being released is anodyne and derivative. Thankfully, that’s not the case on Bama LoveSoul Presents On Deck 3 of that. 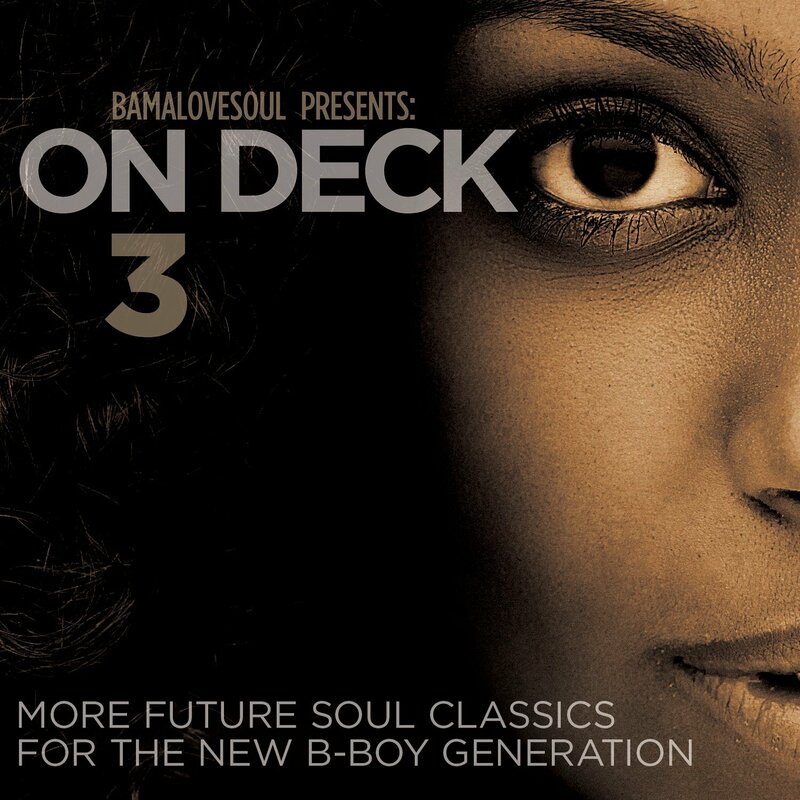 The music on Bama LoveSoul Presents On Deck 3, is music for the 21st Century, from fifteen artists who hopefully, have a big future ahead of them. ← PRIMAL SCREAM-GIVE OUT BUT DON’T GIVE UP.